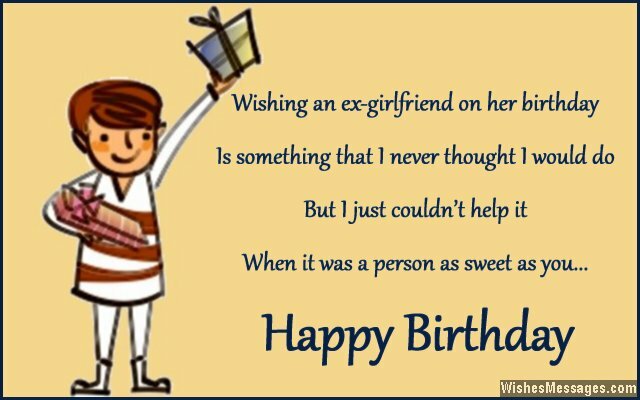 Birthday wishes for your ex-girlfriend: Wishing an ex on her birthday is likely to ruffle a lot of feathers. It might make her think that you miss her a lot. Maybe even make her believe that you still love her and that you’re still not over your breakup. Yes, it can send mix signals, but if worded the right way, a sweet message can actually build bridges and pave the way for a platonic friendship. Depending on your situation, take ideas from this post to write a cute handwritten note or a funny quote on a greeting card for your ex. If you genuinely want to build a lasting friendship with your ex, her birthday is a great opportunity to do so. Don’t be afraid of sending through a DM or a text. Just be sure about what you are doing because wrong interpretations can worsen the pain of your heartbreak. You don’t want to re-live that nightmare all over again, do you? 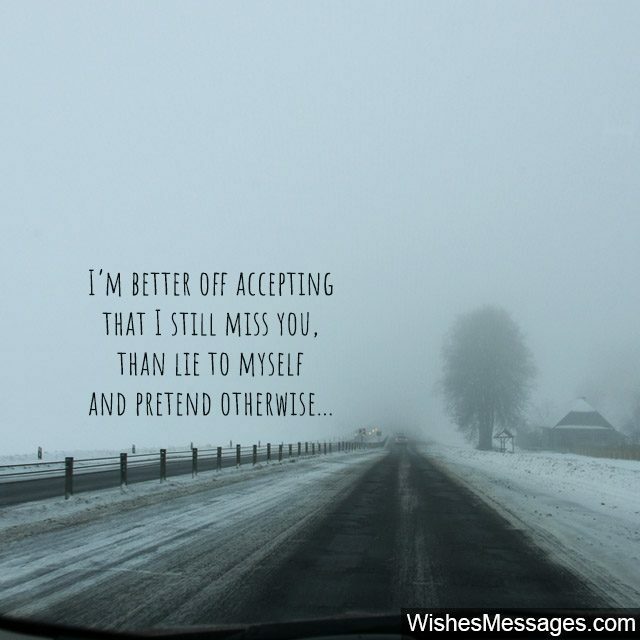 1) I’m better off accepting that I still miss you, than lie to myself and pretend otherwise. Happy birthday. 2) I don’t know if you still miss me like how I miss you, but I hope that now you realize that my love was always true. Happy birthday. 4) Maybe destiny had other plans for us. Maybe we were meant to be friends… friends who’re mature enough to move on from being lovers. I wish you well, happy birthday. 5) Happy birthday to the girl, who was once the princess of my world. 6) Whoever said that you can’t be friends with your ex, obviously never met the two of us! Happy birthday! 7) I felt bitter after we broke up and wished that our relationship was an experience that I never had. But after moving on I have realized that the memories we share make our relationship an experience I am lucky to have had. Happy birthday. 8) Hearts may have been broken, but the memories will forever remain… happy birthday! 9) You know me better than anyone else, so there is no point pretending that I have forgotten your birthday after we walked separate ways. The truth is that I haven’t and I never will. Happy birthday girl. 10) You are my ex-girlfriend and I am your ex-boyfriend. Let’s use your birthday as an opportunity to remove these heavy tags and just call each other friends. Happy birthday. 11) Do I still have feelings for you? Maybe, maybe not. I don’t want to pretend. Do I think we still have a chance? No, maybe some things are just not meant to be. But does that stop us from being friends? Definitely not. 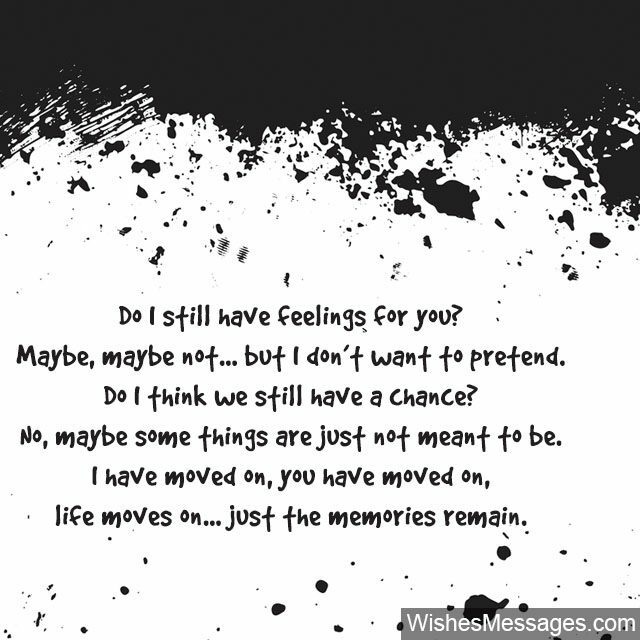 I have moved on, you have moved on, life moves on… just the memories remain. Happy birthday! 12) Destiny had heartbreak in store for us, but I will never use that as an excuse to cuss. Because I still remember the day you said yes when I asked you out. It will be one of the most priceless memories, without a doubt. Happy birthday. 13) I’d be lying if I said that I don’t miss you. How can I not, after all that we’ve been through. Happy birthday. 14) I may have fought with you and called you names, but my intentions were always true. We have broken up since then, but I will still not stop wishing well for you. Happy birthday. 15) I don’t care what other people say. I’m still friends with my ex and I wouldn’t have it any other way! Happy birthday. 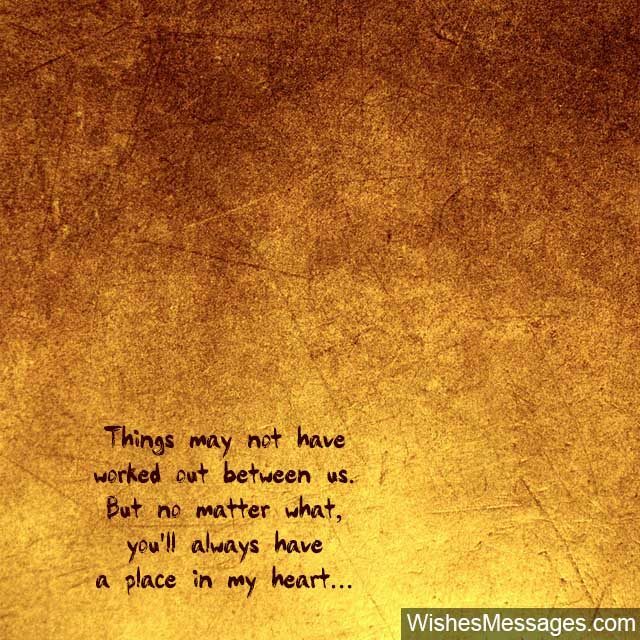 16) Things may not have worked out between us, but no matter what, you’ll always have a place in my heart… as a friend. Happy birthday. 17) The only way to make peace with you past, is to accept it for what it is… that’s what I’ve realized and the first step I want to take is to acknowledge all the amazing memories we’ve shared. Happy birthday to my ex. 18) I just want to let you know that every now and then my heart skips a beat to remind me that it misses you, just like how it used to skip beats to remind me when it once, loved you. Happy birthday. 19) I hate calling you my Ex-Girlfriend. I would rather call you the beautiful girl with whom I’ve shared the most beautiful memories. Happy birthday. 20) You may not smile at me any more, but at least you can smile at your phone when you read this. Happy birthday girl, I miss you. 21) From friends to exes to friends again, life comes a full circle. Happy birthday girl. 22) Sometimes, relationships fall apart so that friendships can start. Happy birthday! 23) Missing you, sometimes makes me teary-eyed. But I have come to realize that we both just weren’t meant to be. After all this time a light at the end of heartbreak’s darkness, I can finally see. Happy birthday. 24) I still love you, it is a fact that I won’t try to hide. But I’ve come to realize that we both just weren’t meant to be… that too is a fact that I can now see. Happy birthday. 25) I hope you are smiling, I hope you are laughing. 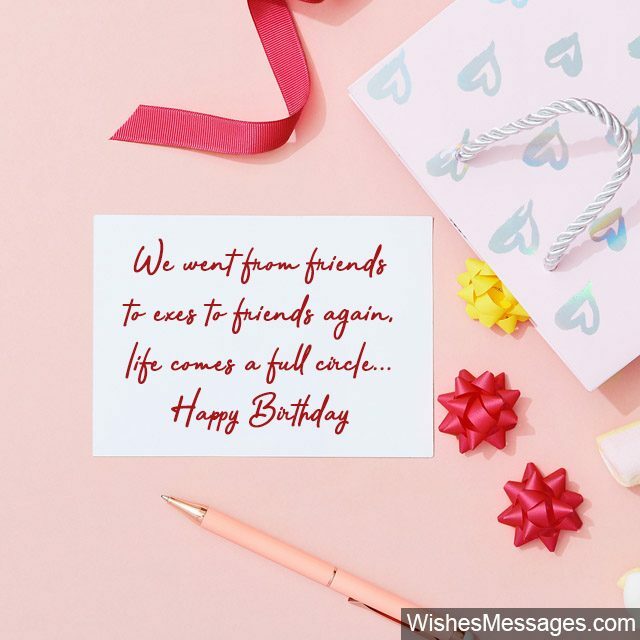 Yes, we share a complicated past but on your birthday, I just wanted you to know that I wish well for you. Happy birthday! 26) No amount of heartbreak can change the fact that you were once the girl whose kisses I starved for and I was once the boy whose hug you longed for. Happy birthday. 27) Your birthday is perfect moment to say, that I loved you then and I love you now. Regardless of the heartbreak, thinking of the memories always makes my heart go WOW. I forgive you girl, Happy birthday. 28) I may have forgotten you as a lover, but I will always remember you as a friend. Happy birthday. 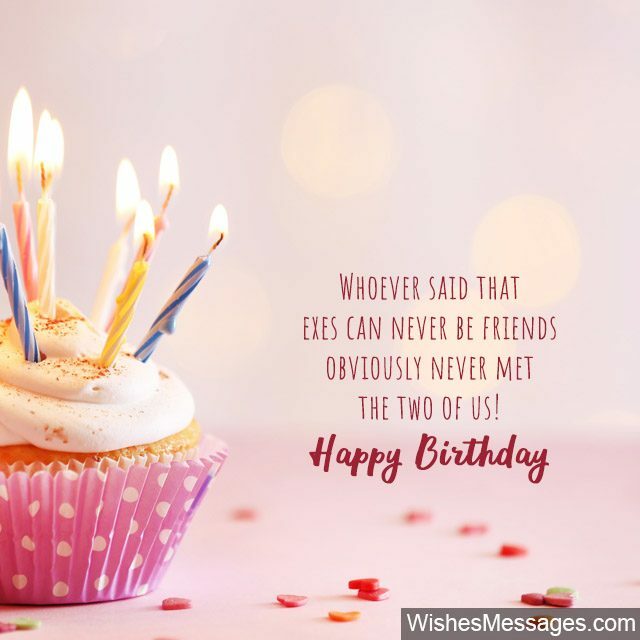 29) Although wishing my ex-girlfriend on her birthday seems a bit strange, I don’t ever remember having any malicious intentions towards you – which is never going to change. Happy birthday. 30) I will never call you my ex and cross you out of my life. You were, are and will always remain my friend. Happy birthday. 31) Wishing an ex-girlfriend on her birthday is something that I never thought I would do, but I just couldn’t help it when it was a person as sweet as you. Happy birthday. 32) I am not wishing you today just because I got a reminder on Facebook. 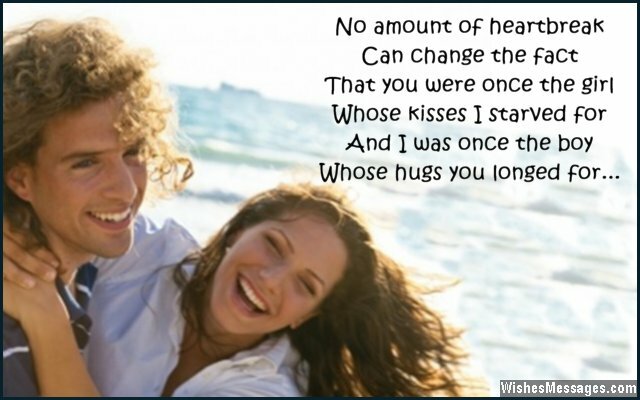 I am wishing you because I am glad that you were once a part of my life. Happy birthday. 33) If birthdays are all about starting fresh and welcoming change, here’s saying goodbye to memories of a sour relationship and welcome a new friendship. Happy birthday. 34) Our relationship was like a romantic movie except that we had a bad script. Doesn’t stop us from being friends does it? Happy birthday! 35) If I wouldn’t wish you on your birthday, it would be an insult to all the precious moments that we have shared in our lives. Happy birthday. 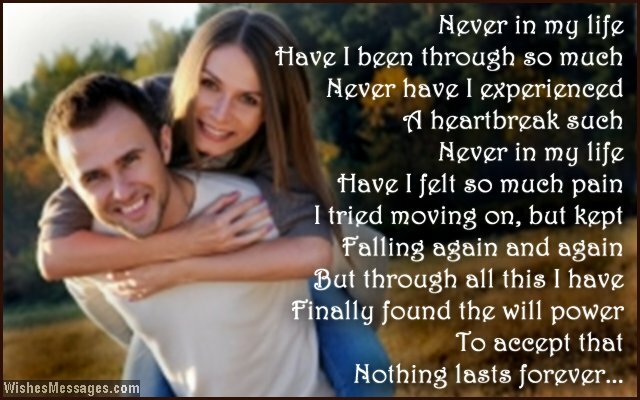 36) Never in my life, have I been through so much. Never have I experienced, a heartbreak such. Never in my life, have I felt so much pain. I tried moving on, but kept falling again and again. But through this all I have finally found the will power, to realize that nothing lasts forever. Happy birthday. 37) Whenever I see your updates on Facebook, I can’t help but take another look. Whenever I read your rants on Twitter, it makes me smile and feel better. Whenever I see your selfies on Instagram, the vibes are sweeter than jam. As you can see I am still hooked to you, coz my love was always so true. Happy birthday. 38) You may by my ex-girlfriend but that doesn’t mean I have lost the right of sending you a text on your special day. Happy birthday. 39) Is it crazy that we’re still friends? Nope. We’re just mature enough to realize that we were never meant to be. Happy birthday girl. 40) All this time I tried to move on, only to realize that I still wanted to be friends with someone who I’ve barred my soul to. Happy birthday.